…an extraordinary read with highly investable characters. …Graham has intricately woven together these elements of cyberspace and our criminal justice system in a way that keeps avid mystery readers spellbound. 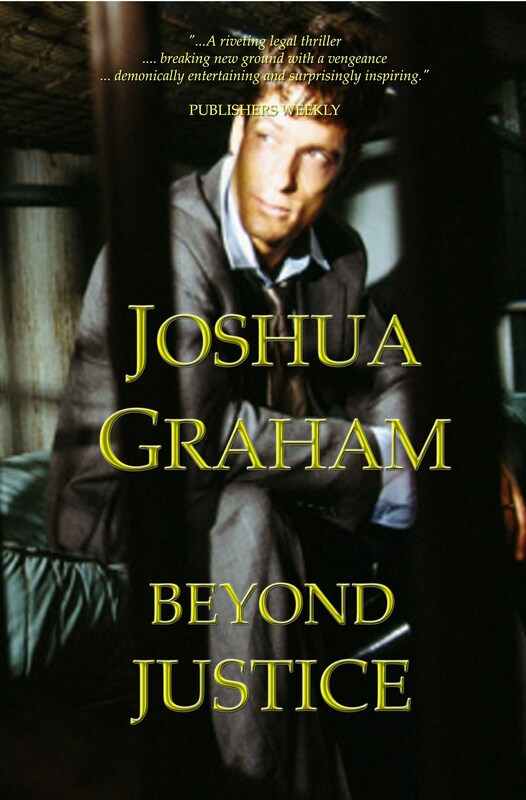 …Graham’s BEYOND JUSTICE is the best mystery novel that I have ever read. …a plot worthy of Hollywood, told by a fantastic author with a deft touch and feel for intrigue! …a fitting climax in true John Grisham form. …a powerful testament to faith and religion, woven into a masterful murder mystery. …This is not a tame Christian book, it’s full of heart wrenching scenes that will make you shudder. “… one surprise after another and it’s a can’t put down thriller…the ending was brilliant! …a riveting legal thriller that has heart and a fabulous message. …I was balled up with emotions and intense suspense from start to finish. …great drama and romance as well. …tied together with a fabulous message of love and redemption. …a legal suspense thriller beyond any other. …Filled with page turning, edge of your seat twists. …most definitely a 5 star novel by an incredible author. … this suspense novel will pick you up in one place, carry you through thrilling turns and emotional rides, and will set you down at an unexpected place, all the while leaving you with a powerful …a message that will set your mind to thinking. About life. About loss. About justice. About everything. …Joshua Graham has become an author who I will be collecting books by for a long time to come and has made me anxious for his next book! …an edge of your seat thrill ride from beginning to end. …a brilliant thriller filled with unforeseen plot twists and character behaviour changes unlike any other. …I quite literally was unable to set this book down. …Joshua Graham is definitely a name to keep an eye on, for he is one talented writer. …fair warning before you pick up Beyond Justice by Joshua Graham–the next 24 to 48 hours of your life will be utterly consumed by this book. …[had] my unconditional and unwavering attention from page one to the conclusion. …draws you in from the first page and literally does not let go of you or your emotions until the rollercoaster conclusion. …mesmerizing would be a gross understatement. …absolutely nothing short of an act of God or nature would have stopped me from finishing this book. …the story will stay with you long after you finish it. …Do not hesitate.Â Rush to get your own copy of Beyond Justice. In prison, Sam fights for his life while his attorney works frantically on his appeal. It is then that he embraces the faith of his departed wife and begins to manifest supernatural abilities. Abilities which help him save livesâ€“ his own, those of his unlikely alliesâ€“and uncover the true killerâ€™s identity, unlocking the door to his exoneration. Now a free man, Samâ€™s newfound faith confronts him with the most insurmountable challenge yet. A challenge beyond vengeance, beyond rage, beyond anything Sam believes himself capable of: to forgive the very man who murdered his family, according to his faith. But this endeavor reveals darker secrets than either Sam or the killer could ever have imagined. Secrets that hurtle them into a fateful collision course. â€œâ€¦ great drama and romance as well.